(Depoe Bay, Oregon) – So much Depoe Bay, so little time. 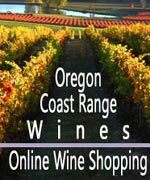 The tiny town on the central Oregon coast and the surrounding few miles are full of a massive array of delights, often some of the most dramatic of scenery on the whole shoreline. Soaring cliffs that create aerial views give way to bundles of secret spots, which then in turn present you with wild waves that crash against jagged basalts of never-ending intricacy and beauty. 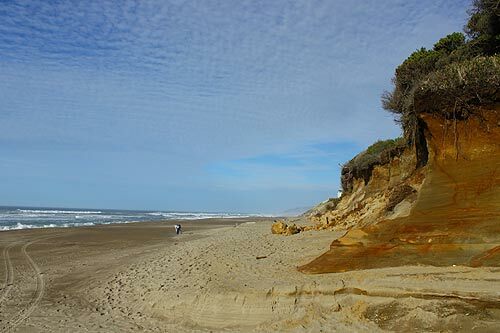 As if that weren't enough, this extraordinarily pretty place is dotted with some of the state's most interesting beaches. Let's start with that crazed spouting horn, shall we? Pictured above, it's perhaps the centerpiece to Depoe Bay. 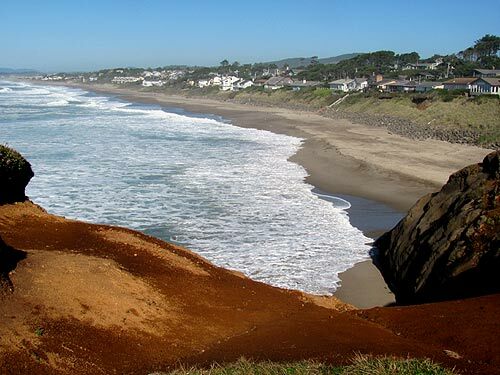 Located right downtown, it's where the ocean water suddenly – and almost always surprisingly – fires off into the air, often soaking crowds and cars. 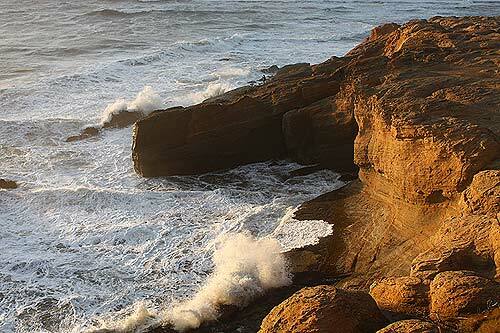 A few miles to the north of Depoe Bay, almost to Lincoln City, sits wild and wondrous Gleneden Beach. Fat, thick grains of sand are one of the more peculiar things about this area's beaches: they're unusually large. The tide lines on these beaches are especially striking as well, with steep slopes ending suddenly in the tide, and causing the incoming ocean to do some fascinating stunts. Another two miles south of there (and about two miles north of Depoe proper), sit more fun and funky beaches, such as Lincoln Beach. This gives way to the sudden changes in landscape where it goes from sandy to craggy cliffs, such as at the tiny and out-of-the-way Fishing Rock State Park. This is perhaps one of the state's most lovely secrets hiding in plain sight. In Depoe Bay itself there's quite a lot going on for such a miniscule village, including loads of whale watching, shopping and the bay itself. Other amazing nature spots abound here as well – too many to mention. But the northern edge and southern edge of the city limits provide two awe-inspiring hidden rocky cliffs. 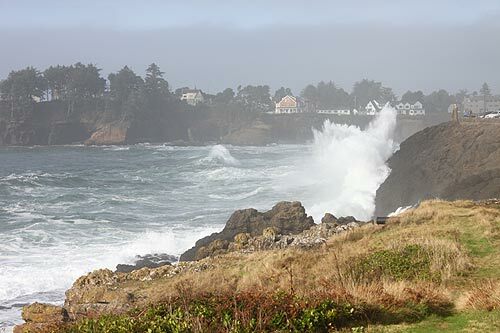 One is found just behind the little strip mall (look for Vista St.), and the other at South Point Road as the road begins to wander southward, away from Depoe Bay (pictured). 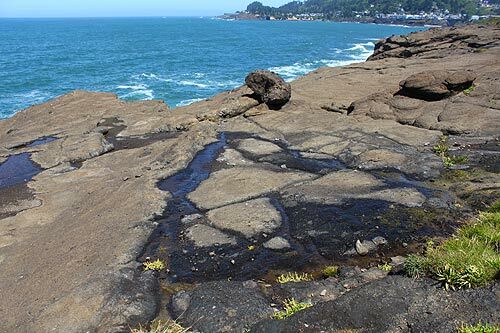 Soon you'll encounter a bevy of insane viewpoints and other attractions, and then the high-rise basalt tower of Cape Foulweather. You can see forever and a day from here. A ways below the cape, after some other fascinating finds too numerous to even glaze over here, another must-see is the Devil's Punchbowl. Among its other mind-blowing scenic amenities, during the winter you can watch the waters angrily swirl around this former sea cave. 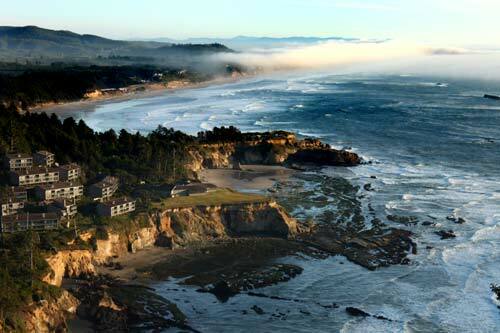 Much, much more about Depoe Bay – including directions to these spots – at the Depoe Bay, Gleneden Beach Virtual Tour, Map.